The legal aid cuts resulted in an 84% reduction in the number of civil (non-criminal) publicy funded cases. Image: Tom Elkins. All rights reserved. After a nine-month delay the Ministry of Justice has now published its post-implementation review of the legal aid cuts that came into force in 2013. To address the chaos that these cuts have caused in our justice system, the government needs to take decisive and dramatic action. Despite some welcome recommendations, the review falls very short. Although the Lord Chancellor acknowledges in the foreword that "the ability of individuals to resolve their legal issues is vital for a just society" the remainder of the review fails to address the reality that, since the cuts, most people simply cannot afford to seek justice. The cuts, introduced in the Legal Aid, Sentencing and Punishment of Offenders Act 2012 (LASPO), have resulted in an almost £1bn reduction in legal aid spending. Legal aid is now unavailable for most types of cases. Many thousands are being denied support, causing untold suffering and having knock on effects elsewhere. We've reported on how the cuts have created unnecessary homelessness and, in combination with the 'hostile environment', have resulted in the Windrush scandal. The impact on families and children going through the court system is enormous. The MoJ review focuses on whether or not LASPO has succeeded in meeting its own objectives, namely “delivering significant savings… by focusing legal aid on the highest priority cases”. But as anonymous blogger and barrister, the Secret Barrister points out, the “Ministry of Justice obsession with restricting legal aid to ‘those who need it most’ (defined so narrowly as to exclude the very people it was intended to help), as opposed to simply those who need it, flies in the face of the original purpose of legal aid." Thanks to extensive input into the review from some of the heroic organisations who continue to fight, against all odds, to help vulnerable people access justice, the MoJ was unable to ignore some of the most important issues affecting our justice system since LASPO. Some of these so-called ‘wider themes’ (which should have been the ‘central themes’) address the everyday problems that people experience when seeking legal advice. For example, even when an individual's situation is within the scope of legal aid funding, people often find they are unable to pass the financial eligibility rules. The threshold has always been difficult to meet but LASPO made it harder. Some of those living below the poverty line can’t pass the test and people have been forced to sell their homes to pay the legal fees. openJustice recently spoke to Mary-Ellen, a severely disabled woman who needed to challenge punitive cuts to her care. She could not pass the financial eligibility test because she owns equity in her home. In response to such criticisms, the government has committed to a “comprehensive review” of legal aid eligibility by summer 2020. The people being affected by these unfair rules can’t wait that long. There are large regions of the country, particularly in rural areas which, since LASPO, simply don’t have any housing or immigration legal aid lawyers left at all. These ‘advice deserts’ mean that even people who are theoretically entitled to legal aid are physically unable to access the advice and support they need. The MoJ refused to commit to paying legal aid lawyers a reasonable wage. Instead it merely stated “there are clearly areas where we need to look further at remuneration”. As a result, invaluable expertise and experience will continue to be lost as a whole generation of lawyers shift to other areas of work. 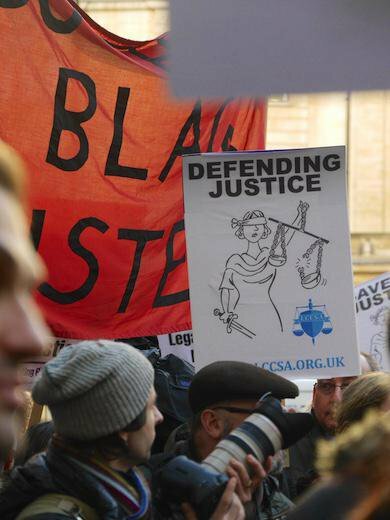 As the Shadow Justice Secretary Richard Burgon MP told openJustice, "within 10 years we might actually see the virtual extinction" of legal aid lawyers. In its review the MoJ did make some welcome recommendations. These include abolishing the rule that people seeking to bring a case in debt, discrimination or special educational needs must first go through a mandatory telephone ‘gateway’ before they can be referred for face-to-face advice (it had previously been revealed that not one discrimination case had been referred to a lawyer via the gateway in an entire year). They have also committed to expand the scope of legal aid in some very limited family law cases. Although not insignificant, these changes are, as Richard Burgon points out, “tinkering at the edges”. Finally, the MoJ committed to a cash investment of £8m to pilot an early advice scheme and invest in supporting people who, since the cuts, are forced to represent themselves in court. This is a fraction of the almost £1bn that has been cut and will not result in the overhaul that our justice system needs. openJustice has been campaigning on the issue of legal aid. We heard from Eleanor, a victim of the Windrush scandal, who was left in limbo for two years when some legal advice would have resolved her problem quickly. We also heard from Nicholas who had to fight the two biggest battles of his life without the help of legal aid – by selling his home and taking out a large loan. And we heard from Ian who, upon being dismissed from his job, suffered mental health problems from the stress of having to represent himself in court. None of the people we spoke to had originally expected that they would need a lawyer. But we never know when a crisis might suddenly hit us. And in this time of great political change and uncertainty, the potential for personal crisis and the need for legal support will only increase. Barrister Sarah Langford describes the law as “human justice, designed and enforced”. But without fair and equal access to justice, the law cannot always be enforced. Individual rights are rendered meaningless and democracy is undermined.